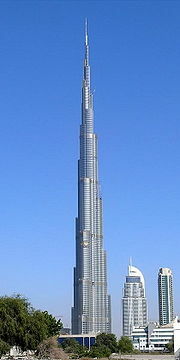 The world’s tallest building has just been opened in Dubai in the United Arab Emirates. Soaring 200 storeys and 828 metres into the sky, the world’s tallest structure has opened in Dubai, a monument to the excesses of the emirate’s bygone boom. But while the $1.5-billion (U.S.) tower’s striking opulence recalls the unrestrained era of a massive property bubble, its surprise name is very much grounded in Dubai’s new reality. Originally called Burj Dubai, it was renamed Burj Khalifa Monday in a tribute to Sheik Khalifa bin Zayed al-Nahayan, head of the United Arab Emirates and ruler of Abu Dhabi, which came to debt-laden Dubai’s financial rescue last month. Abu Dhabi has provided about $25-billion in bailout funds for Dubai in the past year, including a $10-billion lifeline in December that was funnelled to state-owned conglomerate Dubai World to avoid an embarrassing default on its crushing debt load .